Today, Afghanistan is once more embroiled in war, pitting NATO troops and the current government against the ousted Taliban and its allies. Afghanistan is a fascinating but violence-wracked country, where East meets West. Afghanistan is an Islamic Republic, headed by the President. Afghan presidents may serve a maximum of two 5-year terms. The nine justices of the Supreme Court (Stera Mahkama) are appointed to terms of 10 years by the President. These appointments are subject to approval by the Wolesi Jirga. Afghanistan's current President is Hamid Karzai, who was elected in October of 2004. The Vice Presidents are Mohammed Fahim and Adbul Karim Khalili. The population of Afghanistan is estimated at about 31.8 million. Afghanistan is home to a number of ethnic groups. The largest is the Pashtun, 42% of the population. Tajiks make up 27%, Hazaras and Uzbeks 9% each, Aimaks 4%, Turkmen 3% and Baluchi 2%. The remaining 13% are tiny populations of Nuristanis, Kizibashis, and other groups. Over 3.5 million Afghan citizens live abroad as refugees. The majority are in Pakistan and Iran. Life expectancy for both men and women within Afghanistan is only 50.5 years. The infant mortality rate is 117 per 1,000 live births, the worst in the world. Afghanistan's official languages are Dari and Pashto, both of which are Indo-European languages in the Iranian sub-family. Written Dari and Pashto both use a modified Arabic script. Dari is the Afghan dialect of the Persian language. It is quite similar to Iranian Dari, with slight differences in pronunciation and accent. The two are mutually intelligible. Around 33% of Afghanis speak Dari as their first language. About 40% of the people of Afghanistan speak Pashto, the language of the Pashtun tribe. It is also spoken in the Pashtun areas of western Pakistan. 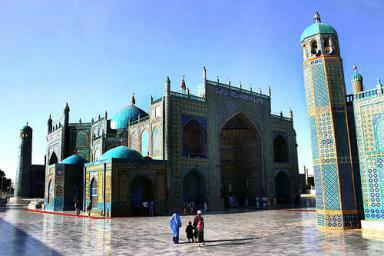 Other Afghan languages include Hazaragi, Uzbek and Turkmen. The overwhelming majority of Afghanistan's people are Muslim, around 99%. About 80% are Sunni, and 19% Shia. The final 1% includes about 20,000 Baha'is, 3,000-5,000 Christians, and one remaining Bukharan Jewish man, Zablon Simintov. All of the other members of the Jewish community fled when the Soviets invaded Afghanistan in 1979. An arid and mountainous country, Afghanistan has little crop land; a scant 12% is arable, and only 0.2% is under permanent crop-cover. The desert experiences sandstorms, carried on winds moving at up to 177 kph (110 mph). Afghanistan is among the poorest countries on Earth. The per capita GDP is just $1,100 US, and about 36% of the population live under the poverty line. The economy of Afghanistan receives large infusions of foreign aid, totaling billions of U.S. dollars annually. The country's most valuable export is opium; eradication efforts have done little to reduce production of this illegal cash crop. Other export goods include wheat, cotton, wool, handwoven rugs, and precious stones. Afghanistan imports much of its food and energy. Agriculture employs 80% of the labor force, industry and services 10% each. The unemployment rate is 35%. The currency is the afghani. As of 2014, $1 US = 56.23 afghani. Alexander the Great of Macedonia invaded Afghanistan in 328 B.C., founding a Hellenistic empire with its capital at Bactria (Balkh). The Greeks were displaced around 150 B.C. by the Kushans and later the Parthians, nomadic Iranians. The Parthians ruled until about 300 A.D., when the Sassanians took control. Most Afghans were Hindu, Buddhist or Zoroastrian at that time, but an Arab invasion in 642 A.D. introduced Islam. The Arabs defeated the Sassanians, and ruled until 870, at which time they were driven out again by the Persians. The nineteenth century witnessed increasing Russian and British competition for influence in Central Asia, in "The Great Game." Britain fought two wars with the Afghans, in 1839-1842 and 1878-1880. The British were routed in the first Anglo-Afghan War, but took control of Afghanistan's foreign relations after the second. Habibullah's younger brother Amanullah reigned from 1919 until his abdication in 1929. His cousin, Nadir Khan, became king, but lasted only four years before he was assassinated. Nadir Khan's son, Mohammad Zahir Shah, then took the throne, ruling from 1933 to 1973. He was ousted in a coup by his cousin Sardar Daoud, who declared the country a republic. Daoud was ousted in turn in 1978 by the Soviet-backed PDPA, which instituted Marxist rule. The Soviets took advantage of the political instability to invade in 1979; they would remain for 10 years. Warlords ruled from 1989 until the extremist Taliban took power in 1996. The Taliban regime was ousted by U.S.-led forces in 2001 for its support of Osama bin Laden and al-Qaeda. What Brought Down the Great Han Dynasty in China? Who Was Andres Bonifacio of the Philippines? © 2016 About.com — All rights reserved.